Last weekend I was in Denver to present at the Mile High Conjure Gala. I was honored to be presenting with several great workers – Co Meadows of the Hoodoo Queen, Ambrozine LeGare, Professor Ames of the Skullbone Emporium, Professor Porterfield, and Candelo Kimbisa of Candelo’s Corner who was the master of ceremonies. The day was set up so that everyone could attend every class with time between classes set aside for readings. The day began with a ceremony for the ancestors and spirits. The spirits were definitely in attendance and it set the tone in a perfect way for the day. First up for classes was Co Meadow’s class on baby dolls. This was a class on old school conjure. None of those store bought doll babies – these were made of socks, sticks, Spanish moss and herbs. As Co explained people used to use what they had on hand and if you could get someone’s sock you had the additional advantage of using a personal concern in your work. We each made a doll baby and Co provided information on how to take care of and work with the doll babies we made. I really enjoyed his class! Co Meadow’s Class on Doll Babies. Next up was Ambrozine LeGare who taught a class on spiritual cleansing, with an emphasis on spiritual cleansing for those who do spiritual work for themselves or others. Her class was was straight forward, no nonsense information on the hows and whys of spiritual cleansing. She also provided several great recipes for cleansing baths, which I am sure I will be adding to my arsenal. I loved that she explained why she does things the way she does, and how she chooses the herbs and ingredients she uses in her customized cleansing products. She also covered areas that are often neglected in cleansing classes such as cleansing pets. Great class! Professor Porterfield, author of several books including A Deck of Spells: Hoodoo Playing Card Magic in Rootwork and Conjure, taught a very interesting class on playing card magic. He talked about how to use regular playing cards for all types of work. He began by giving a brief history of playing cards, and explained that people have been using them for occult purposes almost from the beginning. Professor Porterfield discussed why they were such a versatile magical tool, and how they could be used for several different types of work with examples. Of course the Professor has a one of a kind presentation style so you had fun as you were learning. Professor Porterfield’s Class on playing card magic. Professor Ames of The Skullbone Emporium gave a class on Mojo bags. I was otherwise occupied and unable to attend his class, but all of the feedback I heard about it indicates that it was much enjoyed by those who did attend. It was another hands on class where the participants were able to make their own mojo bag for whatever purpose they wanted to. I was able to purchase one of his oils though, and he gifted me a new piece for my bone set. I will definitely make it my business to attend next year. My class on bone reading was a 72 slide PowerPoint presentation where I provide some background information on bone reading, show and discuss several different bone reading sets and styles, and ultimately have the class do a brief reading together. However, the spirits had other plans. We could not get the projector to cooperate. Things would go well for a few slides and then the projector would say there was no connection. We checked all the connections, restarted the slide show only to get the same message a few slides in. I have given this presentation before with no problems, my laptop is pretty state of the art, and the fact that the presentation would start just fine only to quickly fizzle out leaves me at a loss as to what the problem was. When it was clear that we could not identify, let alone fix the problem I decided to get my bones and just talk about them instead. Thankfully this change in plans was well received by the group and I was able to do some of the things I wanted to do seated on the floor with everyone gathered around. I was so flustered I forgot to tell folks what was in the swag bags so for those who attended, those are coyote foot bones. Candelo Kimbisa of Candelo’s Corner finished out the class portion of the day and we then went on to the dinner for the dead, and the Gala portion of the day. The food was good, though I really missed the salt, and the party after dinner was jumping with a bar and live DJs. What happens at the Mile High Conjure Gala, stays at the Mile High Conjure Gala, but I will say that a good time was had by all! I am so looking forward to next year’s gala! Lest I forget to mention it, the festival was held in a haunted mansion named The Lumber Baron Inn. It is now a bed and breakfast/ fine dining restaurant and bar. The classes were held in the ballroom, which was perfect for this use. There were a lot of vendors from the area and several of the presenters brought their own products to sell as well. There were also readers available between the classes including local bone reader R.J. James*. As a presenter who has done several events in the past, I have to say that this was one of the best festivals of this type that I have ever had the pleasure of teaching at. Our hosts took care of our every need and made it all look easy, even though this was the first time for this event. Loretta, a.k.a. The Death Witch whose dream was the genesis of the gala, and whose planning and coordination made it happen, can be justifiably proud of her brainchild. Thank you Loretta. And a special thank to the owner of the inn, Elaine Bryant. So many other folks helped to make this event seamless – thanks to you all! Dinner for the Dead. The meal was served in reverse and with no salt. My festival purchases and gifts included a knitted bag for carrying bones from LyannaKnits.com, Herbal Tea from EarthWitchHerbals of Etsy, Body Butters from theblusaint, a blessed and loaded deck of cards, and a loaded plumb pendulum from Professor Porterfield, and an oil from The Skullbone Emporium. I also bought a cleansing soap made by Co Meadows called Washdown/Nettoyage, but after a long day of doing readings I used it at the Gala so it is no longer camera ready. I must say that it was effective though, and I felt great after using it. If you were interested in magic, rootwork, conjure, divination, ancestor and/or spirit work you should start planning now to attend next year. It will only be bigger and better. I know it’s early, but I am posting 2018 contact info now – mhconjuregala@gmail.com. I would be very surprised if next year doesn’t sell out quickly. P.S. Rumor has it that Starr Casas may be a presenter at next year’s gala. 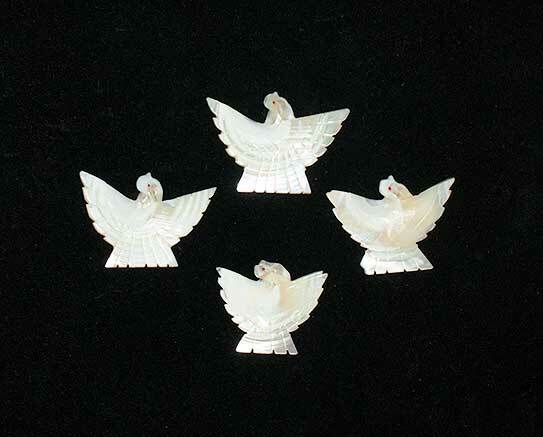 There is a Mother of Pearl bird in my set to represent messages from spirit or from the ancestors. It may be near a particular ancestor piece, in which case it could be a message from that ancestor. But no matter where it is on the cloth, if it is face up there will be a gift from spirit whether a message, or just the knowledge that the client has a gift in this area. That is not to say that if the bird is face down that the person has no spiritual gifts, nor any ability to communicate with spirits, just that there is no need to give the client that information at this time. When the bird is right side up it may be that the person has been working with spirits for a long time and just needs a reminder, or it may be a push from a specific ancestor, or the person has never tried communicating with or working with spirits and the ancestors want them to try. I believe we all have the ability to communicate with our ancestors. Like any other talent some of us are more gifted than others, but I believe they hear us no matter what, and if we pay attention carefully they are communicating with us as well. We may actually hear them speak to us, or we could have a dream with the information we need, or we could start noticing signs. A client could have the bird be face up in one reading and face down in the next. Their abilities haven’t changed – the information they need to hear at that time from the reading is just different. Two carved bone birds and several different sea shell birds. PS – if you get a one-on-one bone reading lesson from me, I mail you a Mother of Pearl bird. Bone readings are messages from the ancestors and the bird symbolizes that. It is a small token of thanks from me. You can use it or not in your set. I understand that every set is different and this piece may not resonate with you. I will not be hurt, or offended if you do not use it. You can also use it to mean anything you like. It doesn’t have to be a messenger. In both my bone sets I have a piece that represents an ancient ancestor. It is an ancestor so far back that we can no longer know if it was male or female, or whether it is a relative from the mother’s side, or the father’s side. The only thing we know about it is that it is ancient and powerful. I searched long and hard for a special shell to represent this piece. I didn’t know just what I was looking for, but I knew I would recognize it when I saw it. As it turns out, I recognized it when I picked it up and held it in my hand. I picked it up because it was different from all the other shells in that bin. When I turned it over and looked at the price I saw it cost a lot more too – it had apparently been placed in the wrong bin by am employee or a customer. But when I held it in my hand while looking for its proper home, I could feel an energy coming from it. I put it in my basket and decided to think about it while I continued shopping. Long story made short – I ended up buying that shell. I have yet to see another like it. I have seen other shells of that species, but not with its pattern and coloring. In my book I described it as “Ancient Ancestors,” but I don’t think I really explained it much beyond that. When it is near a person I look to see if there is a message. But even if there is no message, the presence of this piece nearby tells me that the client has an ancestor like this nearby watching over them. To me this is a special blessing. 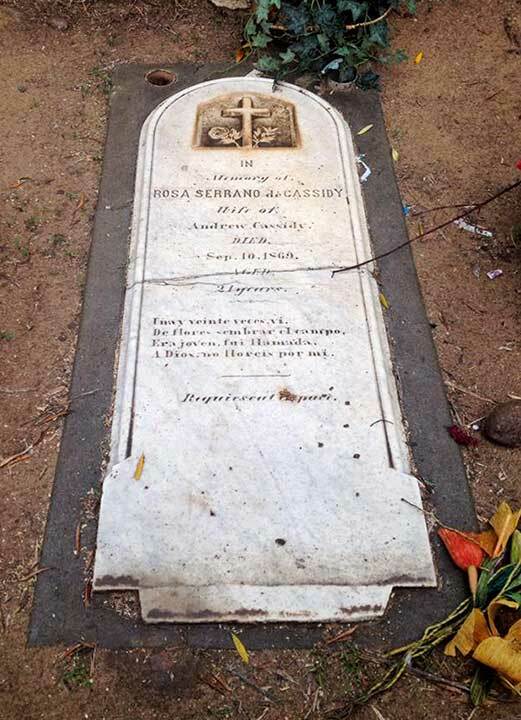 At the point this ancestor appears in your family tree they may have hundreds, if not thousands of blood descendants. That they are taking a particular interest in you out of all those others implies a gift. It could be that you share a similar gift or calling in life. I generally think of these gifts as gifts of the spirit – healing, or divination, or a creative talent. I think it has to be something that is universal throughout time. Every generation in every culture had healers, diviners, and artisans. Recently, in a conversation with Ancestor Healing he said that “the ancestors that are far back in our bloodlines appear the weakest to our intellect, but they have the most powerful energy.” That sums up nicely how I feel about this piece. Ancestors like this are hard to imagine or get a mental image of – we have so little to go on, but they themselves have the wisdom of ages. 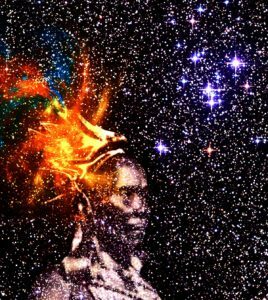 If in your self readings this ancestor keeps making it’s presence known you might want to consider doing a reading with just this ancestor. You might also consider getting an ancestor reading of some type in order to get more information. I have listed some readers who offer this type of reading in the right hand sidebar of this post . It is by no means an exhaustive list, and I am certain that I have left off many fine readers offering this type of reading. There are several different reading styles and mediums represented. While several are bone readers, they may or may not use the bones for this type of reading. If you are interested in an ancestor reading, check out their web pages and then contact them if you still have questions to find out which is the best fit for your needs. If you are a reader who offers this type of reading on your website who would like to be listed, please let me know. I have been following a system of using the alphabet for blog post prompts. I already have a post in the queue for the letter “K,” which is next up. However, a Facebook posting on ancestral work grabbed my attention this morning so I decided to write about using the bones to dialogue with an ancestor. In my bone set I have specific pieces to represent various people both embodied and disembodied. There are pieces to represent family ancestors and pieces to represent other spirits that are around a person. For the ancestor pieces I have specific pieces for parents, grandparents, great-grandparents and further back, and a piece to represent the ancient ancestors so far back that no one knows or remembers their names. I use sea shells for these pieces because they come in such a wide variety of sizes, shapes and colors. This makes the pieces easy to identify quickly. I also have a piece to represent messages from the spirit world. It is the piece that I give out at my workshops, and send to my Skype students via snail mail – a Mother of Pearl bird. I don’t tell people what they should use the bird for. They may decide that the bird represents a trip by air or they may decide that they don’t like it and throw it away. Bone reading is too personal in my mind for me to try to specify pieces and meanings for others. I am giving my meaning here for ease of understanding. I have another piece in my set to represent messages from living people – the bird is for the dead. If the bird lands face up, very close to or touching a piece that represents an ancestor or other spirit, I interpret that as the spirit having a message for the person that I am reading for. Pieces nearby can give information on the content of the message, but sometimes the only information is that the ancestor wishes to speak. If the person works with their ancestors and spirits already, not much more need be said. They will use whatever method their spiritual tradition provides to follow-up on their own. If the person is unfamiliar with spiritual work of this type I sometimes do another throw to get more information. In this second throw I usually take all of the other ancestors out of the set so that the ancestor who wishes to speak has full use of all of the remaining pieces in conveying their message. By these means a person can enter into a dialogue with an ancestor. Now the caveat. Once I added ancestor pieces to my set and started reading for friends I found that my friends usually got it. Even if they did not do work with their ancestors and spirits they had some sort of familiarity with the idea of ancestor and/or spiritual work. This is because I tend to hang out with people who have similar interests to my own. When I started reading for a wider public I found that things were sometimes quite different. Some people had no concept of ancestor or spiritual type work. Most of the time people with no previous exposure to ancestor work are pleased to hear information from or about a loved one who has passed on and some even state that they will start to work with their ancestors as a result of the reading. However, sometimes discussing a person’s ancestors brings back painful memories. Getting more information or even just elaborating on what is already there can make the pain worse. When I notice a strong reaction in this area I gently ask if the person has had any counseling around the issue and if the answer is no I gently recommend that the person seek professional counseling of some type in addition to any spiritual work they are having done. Be sensitive, listen to your ancestors and spirits, and know your limitations as a diviner. That said, the bones are extremely well suited for establishing a dialogue with one’s ancestors, and most of my experiences reading for others have been positive in this area. Most people are delighted with the idea that a beloved parent or grandparent is still watching over them and is eager to continue or establish a relationship. Many ask for information on how to start working with their ancestors and later come back and tell me about the positive effects this work has had on their lives. Hearing this makes me happy. I think it makes the ancestors happy too.